In the laboratory researches on automated systems for biometric authentication are conducted. The area of researches’ interest are both positive authentication systems (“I am who I claim I am”) and negative authentication systems (“I am not who you are looking for”). As a carrier of distinctive features there are used biometric traits, which acquisition can be performed contactless - from a distance, like for example face and iris. In the constructed system iris pattern features unique for each individual will be derived from analysis of the iris structure image taken under NIR (Near Infrared) light. Unique face features will be computed by analyzing two data sources acquired simultaneously: face image taken under visible light and face geometry range image acquired using 3D laser scanner. The main aim of the project is to design simple, low-cost device able to realize iris positive authentication within DMCS employees that can be practically implemented in B18 buliding on TUL campus. The scientific goal of the project is to design less-cooperative iris-based biometric authentication system as well as methods and devices for acquisition of images with sufficient content of distinctive features. 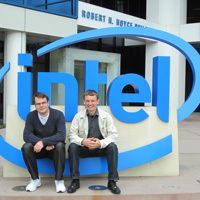 Kamil Grabowski and Wojciech Sankowski came back from two months internship at Stanford University. The internship was organized by Ministry of Science and Higher Education in the frame of the program Top 500 Innovators Science - Management - Commercialization. 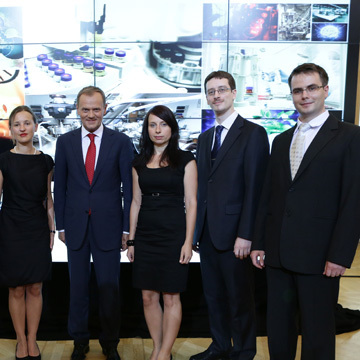 This was the second edition of the program during which group of 40 participants from many various polish academic institutions were trained. The participants had classes at Stanford University on commercialization of scientific researches they are conducting. Moreover the program included site visits, during which the participants visited such companies like Intel, NVIDIA, D2M (Design to Matter), IDEO, Cisco, Exponent and Google. The internship took place from 28.04.2012 till 30.06.2012.